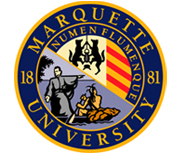 The Marquette University logo, complete with the Be The Difference tagline, is the official university signature. It should be used prominently on promotional materials, including publications, advertising and electronic media. 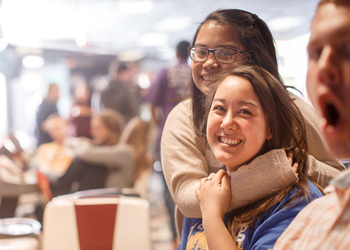 Using the Marquette logo in a consistent manner is vital to communicating Marquette's identity. The vertical or horizontal version of the logo is acceptable, depending on design and space considerations. The logo was designed to be used in its entirety. The type and tower graphic must never be used separately. Reproduction of the university logo must adhere to the color, size and spacing guidelines outlined in the brand logo guidelines. The university seal is reserved for use on approved official and presidential documents and events. Approved merchandise also may use the seal. For permission to use the seal, contact the Office of Marketing and Communication at (414) 288-7448. The athletics monogram was designed for the express use of the departments of Intercollegiate Athletics and Recreational Sports. Only varsity and recognized club athletics teams, communication pertaining directly to athletics teams, and approved merchandise may use it. The logos for endowed colleges should be used prominently on endowed college and college departmental promotional materials, including publications, stationery, advertising and electronic media. The logos were designed to be used in their entirety, with the type and tower graphic together. The vertical or horizontal version is acceptable, depending on design and space considerations. Unit logos should be used as the primary university identity on materials promoting the college or department, including publications, advertising and electronic media. The Be The Difference logo should be used as a secondary identity on back covers or similar secondary use. The vertical or horizontal version is acceptable, depending on design and space considerations. Contact the Office of Marketing and Communication at (414) 288-7448 to obtain these logos.